A Wind is Rising and the Rivers Flow. A. Lassell Ripley - Sporting Etchings. Albi-The Cathedral of St. Cecile. American Prize Prints of the Twentieth Century. Amiens - The Cathedral of Notre Dame, From the Lower Town. Arch of St. John the Devine. Blow Gabriel (One Man Band). Bucks County, New Hope, PA.
Canal in June and Miniature Lighthouses. Castle Garden (part of Battery Park). City Lights or Madison Square Park. Clare Leighton - The Artist and Her Work. Derricks and Men (Riding the Girder). Farthest North in New York. Flirting On The Sea-Shore and On The Meadow. 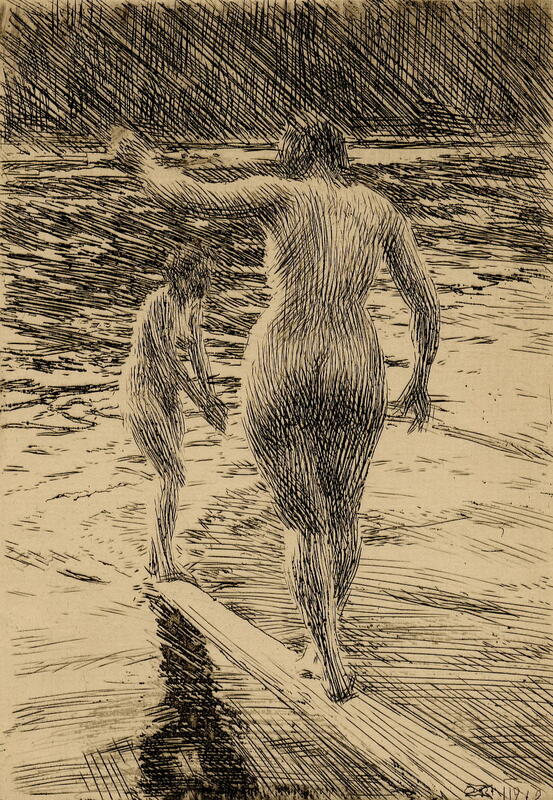 Frank W. Benson's Etchings, Drypoints and Lithographs. House On Main Street, Easthampton. John Taylor Arms, A Man For All Time. John Taylor Arms-Plates of Perfect Beauty. Le Puy, The Cathedral of Notre Dame. Lower Manhattan From The Bridge. Mabel Dwight - A Catalogue Raisonne of the Lithographs. Memento Vivere, Notre Dame, Evreux. Mills Hall (Mills College, CA). Mr. Gleason On His Beat. New York Charities - St. Barnabas House, 304 Mulberry Street. New York Nocturne, Brooklyn New York. North Village (Port Clyde, ME). On The Beach - Two Are Company, Three Are None. On The Beach At Long Branch-The Children's Hour. Polo Spill - Aspects of Suburban Life. Portrait of Charles Martin Loeffler. Puerta Principal De La Iglesia De San Pablo, Valladolid. Sea-Side Sketches - A Clam Bake. Skating On The Ladies' Skating-Pond In Central Park, New York. St. Paul's Church, Lower Manhattan. Steps To The Sky (Eastport, ME). Stow Wengenroth's Lithographs: A supplement. Study for “The Rookeries, Greenwich Village”. The Army of The Potomac - A Sharp Shooter on Picket Duty. The Chinese in New York-Scene in A Baxter Street Club-House. The Cottage by the Sea. The Crown Princess Margaret of Sweden. The Gargoyle and his Quarry, Notre Dame. The Last Days of Harvest. The Lithographs of Stow Wengenroth. The Olive Trees of the Riviera. The People Work - Night. The Prints of Louis Lozowick, A catalogue Raisonne. The Prints of Rockwell Kent, A Catalogue Raisonne. The Rose Window, St. Thomas. The Summit of Mount Washington. The Wreck of The Atlantic-Cast Up By The Sea. To Keep A Tryst With The Dawn: An Appreciation of Roland Clark. Two Boys On A Beach No. 2. Two Boys on a Beach, No. 1. Under The Falls, Catskill Mountains. Westminster Palace, Houses of Parliament. Wreck of the ol '97. Ernest S. Kramer Fine Arts & Prints, Inc.
FINE ARTS AND PRINTS Inc.
Etching, 1919, Hjert & Hjert 287, First State.